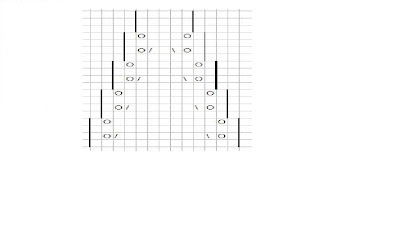 This is the second part of the pattern that begins here (click the word "here"). 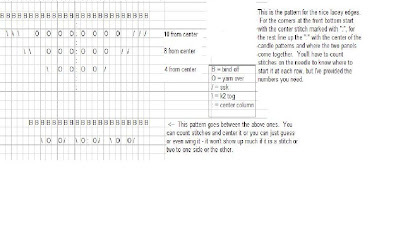 Here is the rest of the pattern, which I just got up on Flickr, but a little blurry because for some reason it shrank everything down and I had to enlarge it. To begin, cast on 29 stitches, 5 each for the front and center panels and 7 each for the two candle panels (after 5, 7, 5, 7, & 5). Put in markers where one pattern stops and the next one starts or it will get too confusing! I just tied some contrasting yarn around the knitting needle there. You pass these to the next needle whenever you come to them in knitting. 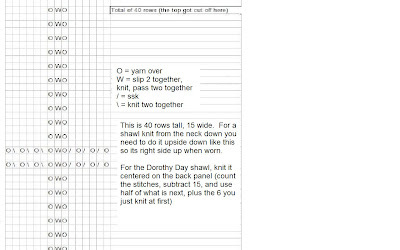 Knit the next row, then purl the next row, then begin following the instructions for the different panels, which is just the slow increase for three of them and the beginning of the candle pattern for the other two. For the center panel, wait until you have around 15 stitches to start it, then begin the cross pattern. On the front panels there are two little crosses near the bottom. I started them the same row as the top of the last candlesticks. I centered it but you can put it more toward the corners too. I used two patterns for the edges, the first is centered on where each panel joins, the center of each candle panel, and at the edges. The other fills in the gaps and starts the last knit row before you bind off. This is blurry - you can see it a little better on flickr. The top one starts 6 rows before the end. 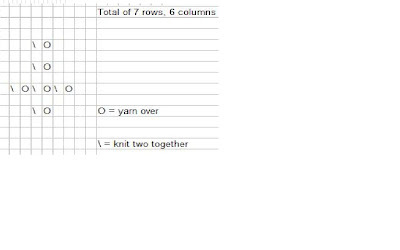 It is the one that goes where the different panels come together, centered on the candle panels, and half of it on each bottom corner (knit from the ":") I don't know a better way to tell how to do it than to say you find the center stitch, line up the ":" in the chart with that and count stitches to see where to begin. I've supplied the numbers but in case you can't read them, the first row begins 4 from the center stitch, the next (knit row) 8 from the center and the last one 10 from the center stitch. Kind of centered between these "flourishes" are a simple pattern on the last knit row before you bind off, which is three sets of \,O,K,O,/,K . You can try to center them but it doesn't show much if they're a stitch or two off center. what a beutiful shawl! I might like to knit a plain one with no design as I am not a very good knitter! The candle part is a little hard but you could probably substitute any pattern for a triangle shawl instead - some are easier than others. Still, don't sell yourself short - you may do better at it than you think! Lace has the wonderful thing that you block it which evens out uneven stitches and makes it look very professional even when it didn't look so great before. But you don't get to see the results until you take it off the needles, which can take some patience! A truly lovely thing, I will make this soon. It looks wonderful. Is it for an adult or child? What was your gauge on this? I'm using a lace weight (read: thread) on it, so I was worried about size and whether the pattern would show up. Sorry, I no longer have the shawl and didn't write down the gauge. It says worsted weight, and I think I knit it a little loosely, so probably around 16 or 18 stitches per 4 inches.